1. Where is my Capacity data? There are many interesting developments around Azure Operational Insights (OpInsights) service, ranging from new Intelligence packs to search data syntax improvements. This article focuses on the Capacity Planning intelligence pack, and how to get up and running with it. The Capacity Planning intelligence pack is one that garners a lot of attention and enthusiasm during demos. What’s not to love about a tool that gives us greater control over our data center capacity, and that enables us to better project and plan for our future compute and storage needs? That’s the sort of insight that makes this service live up to its name. We get the gist, it’s awesome. That is… whilst it's working. Should we fail to see any data some days after adding the intelligence pack to our workspace, or the Capacity Planning tile stops displaying data. This article will provide some practical tips on how to hit the ground running with the OpInsights Capacity Planning intelligence pack. We will also cover how to handle some common issues we may encounter. 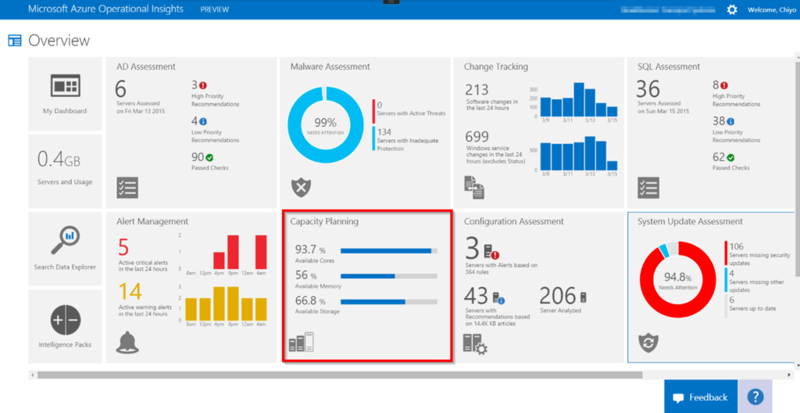 After we add the Capacity Planning intelligence pack to our workspace in Azure Operational Insights, the common issues we are likely to encounter are of 2 types. NOTE: The steps below will assume that we are using Operational Insights as an Operations Manager service that consists of one or more management groups with agents in our management group(s). 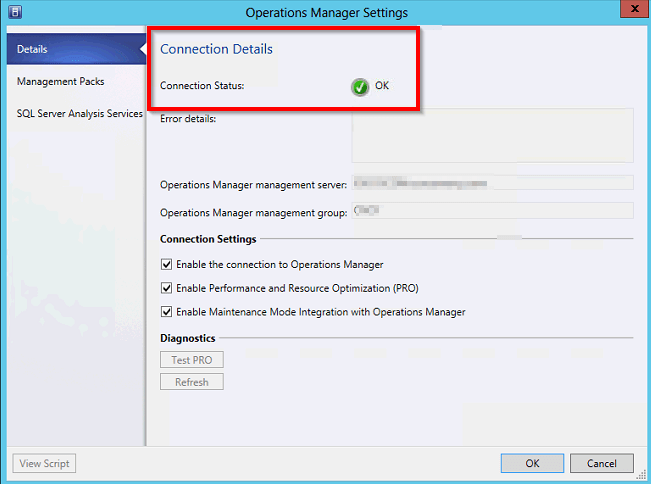 The first thing to do here is to review the steps for configuring the OpsMgr-to-VMM connector, and ensure it’s working. This is necessary for data aggregation to succeed. Kevin Holman also wrote a detailed guide on the subject. The next step is to confirm that the OpsMgr-to-VMM connection is configured and working. 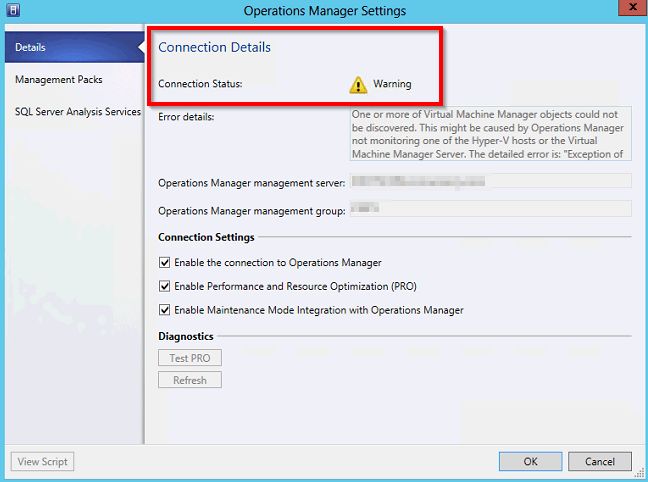 In the VMM console, navigate to Settings |System Center settings | right-click Operations Manager Server and select Properties. Connection status of “OK.” is self-explanatory. More about this later. Note that although two of the three listed management packs have the same name, they have different internal Ids and all three need to be imported into OpsMgr. These management packs collect operational data for storage analytics, collect operational data for cloud attachment and storage data analysis, and collect operational data for cloud attachment respectively. Very importantly, a couple of object discoveries will run, but we want to pay particular attention to the Microsoft System Center Advisor Windows Server Discovery in the Microsoft System Center Advisor Capacity Intelligence Pack. 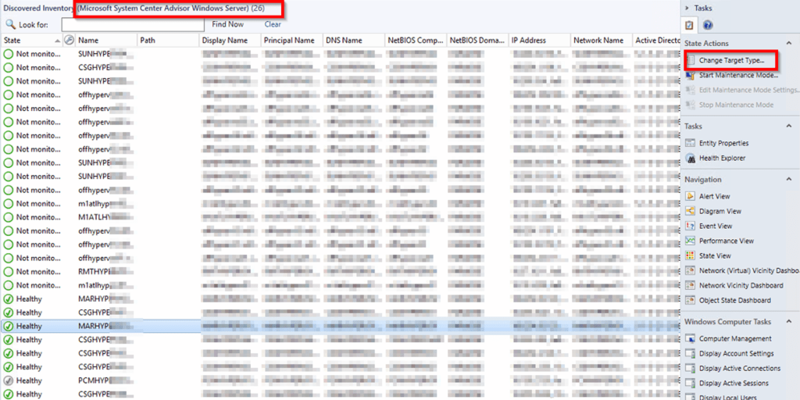 If we do not see this discovery in OpsMgr under Authoring | Management Pack Objects | Object Discoveries after adding the intelligence pack in OpInsights, it’s usually an indication that one of the Microsoft System Center Advisor Capacity intelligence packs listed above did not get imported. Remove the management packs, and wait for about 10 minutes for the management packs to get imported into OpsMgr again. After the discovery runs navigate to Monitoring | Discovered Inventory in the OpsMgr console and set the target type to Microsoft System Center Advisor Windows Server. After about 5/10 minutes, we will start to see the discovered Hyper-V servers in our console. After the Hyper-V servers get discovered capacity data should get sent up to the OpInsights service. The data will then get aggregated and then displayed in the Capacity Planning tile in our workspace. In my experience it has taken between 24 – 30 hours for capacity planning data to show up in the Capacity Planning tile as seen in Figure A below. It will however, take at least 7 days of data to build out projections, after which the tile will be updated to show our future growth projections and capacity growth as seen in Figure B below. 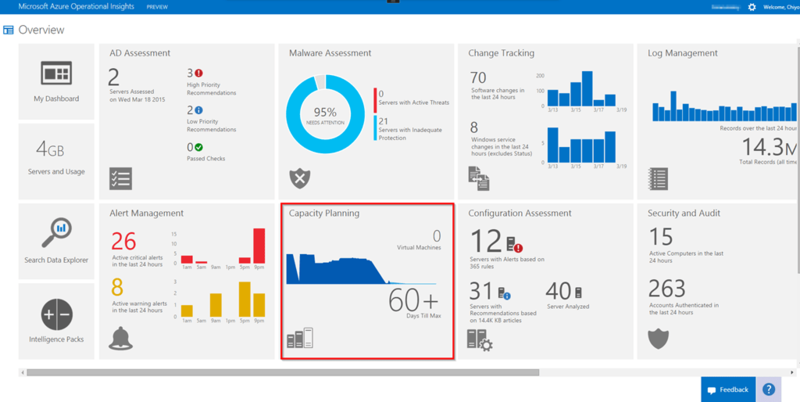 While the first scenario focuses on tips for getting started with the Azure Operational Insights Capacity Planning Intelligence Pack, this scenario will focus on suggested remediation steps to take when the Capacity Planning tile stops displaying data. If we’ve successfully got the Capacity Planning tile to display data in our workspace but it later stops displaying data, there are a couple of configurations to double check. Settings | System Center Settings | Operations Manager Server | Properties, review the connection status. 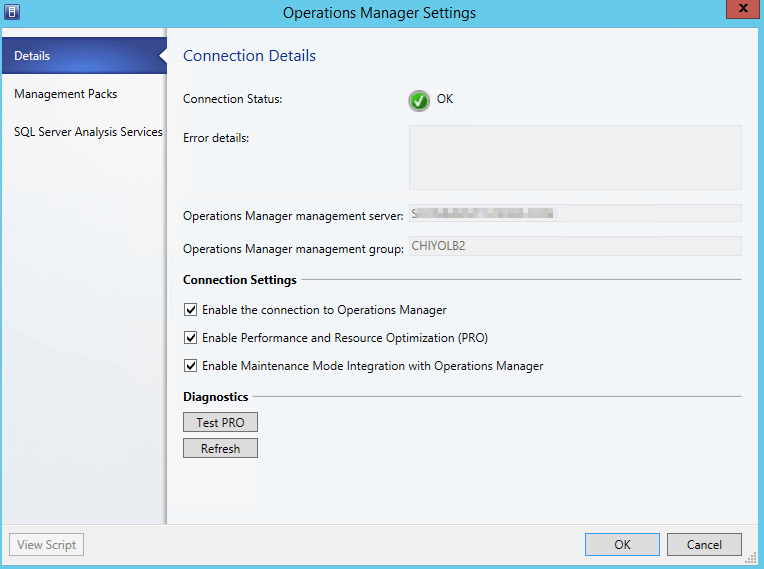 Remedy this error by removing the Operations Manager Server: Settings | System Center Settings| Operations Manager Server | right-click and select Remove, and then add the server again by right-clicking on Operations Manager Server, and selecting properties. After performing the following step, we should see one of two connection state which are acceptable depending on our environment. A “Warning” connection status, indicates that the error no longer persists, but that some other issue needs to be addressed. 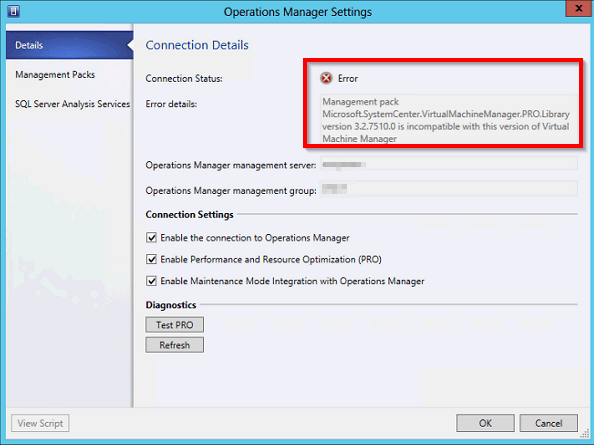 Review the error details to learn more about any identified issues affecting the OpsMgr connection to VMM. If we’ve updated our Hyper-V configuration in VMM such as by adding/removing a Hyper-V cluster etc., confirm that the Hyper-V servers are agent managed, or deploy SCOM agents to the servers, and confirm that the server get discovered in OpsMgr by looking under Monitoring | Discovered Inventory in the OpsMgr console, and setting the target type to Microsoft System Center Advisor Windows Server to display the discovered Hyper-V servers. After addressing the issues with the OpsMgr-to-VMM connection, It could take up to 24 hours for the Capacity Planning tile in Azure Operational Insights to start displaying data again. The Microsoft Operations Manager Team has an excellent article on other Azure Operational Insights troubleshooting Steps. Review procedure 3 and procedure 4 under the section “Verifying if things are working post completing the configuration wizard” for more practical troubleshooting steps.